The airfield sits at an elevation of 6,264' msl. Runway 18/36 is 8,544’ x 100’. Unicom is on 122.85 and AWOS is on 124.725. Reno FSS is on 122.25 and approach/departure frequency is through Oakland Center on 127.95. The airport is an all weather field with multiple instrument approaches. We offer full-service fueling, line services, hangar space, tie-downs, pilot supplies, car rentals, discounted hotel rates, complimentary food and beverages, flight planning, catering, concierge services and more. For a complete list, go to Services. 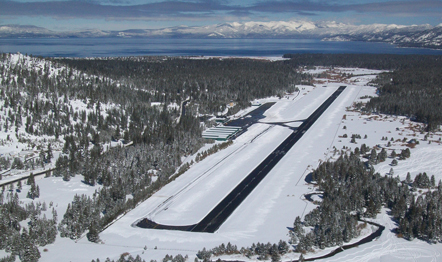 Get detailed airport information and current fuel pricing on the AirNav Web site for additional information about Lake Tahoe Airport, visit the airport’s Web site. Additional amenities available on the field include scenic flights, charter service and flight training. The Flight Deck Restaurant overlooking the runway has perhaps the best views of any airport restaurant.